At Carter Real Estate, we work with clients looking to buy or sell real estate in Laurel, Mississippi and surrounding communities. Our expertise includes residential and commercial properties, farm and land sales and property management services. We offer full-time representation with a personal touch and take pride in our work and relationships with customers. Our service-driven and detail-oriented real estate practices have proven successful year after year. As a former RE/Max broker for five years, the company had been consistently one of the top-5 companies in the Laurel Association. As a real estate agent, Nedra Carter, has been a top-5 multi-million dollar producer for 9 consecutive years. Nedra started Carter Real Estate in 2016 and continues the standard of excellence as was established for many years. We offer FREE market analysis in which you’ll receive an honest assessment of the property with comparables. Contact Carter Real Estate today to begin finding the perfect home for you and your family. It’s our goal to make the buying or selling process as smooth and successful as possible for our clients! Confidential service and integrity for buyers and sellers of real estate. HGTV’s newest show titled “Home Town” takes place in Laurel, MS. The show follows Laurel residents Erin and Ben Napier as they fix up a house in their hometown. 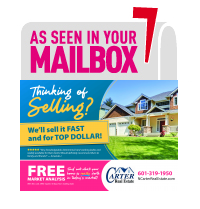 Whether you’re looking for a single-family home, condo, new office space or farmland, trust Carter Real Estate! Nedra & Rick Carter of Carter Real Estate are committed to unsurpassed customer service & great results. Are you buying a new home in Laurel, MS or a neighboring community? Call Carter Real Estate!